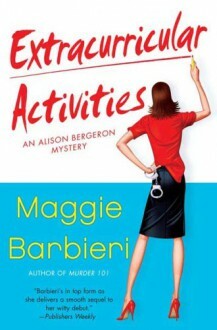 You'd think, now that she's off the hook for murder, Alison Bergeron, an English professor at a private college a stone's throw up the Hudson from Manhattan, would be able to relax---but how can she with a wedding in the works? Alison is happy for her best friend, Max. Really, she is. She loves Max, and the guy Max is marrying completely adores her. Even being in the wedding wouldn't be so bad, if it'd keep her from thinking about her off-again relationship with the married NYPD homicide detective Bobby Crawford. However, Bobby's the best man, and that forces them into all kinds of awkward situations, like dancing cheek to cheek and sharing a bottle of champagne. Then, when Alison's ex turns up dead, she's dragged into another murder investigation. Convinced it's the handiwork of one of her former student's parents, a local Mob boss, and afraid for her life, she turns to Bobby for help, but threatening a Mob boss while he's fulfilling a vendetta may not be the best idea.